Delacroix was seven years younger than Théodore Géricault and his closest artistic heir. Although they knew each other little, having crossed paths briefly in Pierre-Narcisse Guérin’s studio, Delacroix carried the older artist’s powerful innovations to their full fruition. His name has come to denote Romantic French art in the same way Lord Byron’s does Romantic poetry. Separately but concurrently, Delacroix and Géricault made their forays into printmaking during the beginning of the great era of lithography in Paris. In 1825 Delacroix made his first foreign journey to London, just as Géricault (who died in 1824) had done at the beginning of the decade. Delacroix’s experience in London was crucial for the development of historical and literary themes in his art. He also found lasting inspiration in the works of Shakespeare, Byron and Walter Scott. Delacroix’s earliest important lithograph, Macbeth consulting the witches (AGNSW 322.2008), appeared shortly after his return from England, reputedly the first such print to have been drawn entirely with a scraper so that the whites appear scratched out of the inky ground. This was followed by a succession of literary prints, notably the series illustrating Goethe’s Faust in 1828, and Hamlet in 1843. Art for Delacroix was a means of reconciling powerfully opposing forces and emotions – savagery and grace, cruelty and beauty – such as he perceived in the animal kingdom (and in socially transgressive forms of human behaviour). The habits of wild cats, in particular, revealed nature’s primal instincts and energies, ungraspable by human reason. The celebrated Royal tiger, and its companion piece Lion on Atlas, which is also in the Gallery’s collection, are Delacroix’s finest works in the lithographic medium. These prints date from the late 1820s when Delacroix frequented the various Paris menageries and zoos in the company of the animal sculptor Antoine-Louis Barye. Delacroix never had the opportunity to observe lions and tigers in the wild; his superbly vivid renderings of big cats are based on careful studies made of them in captivity. To understand their anatomy better he also attended dissections and made écorché (flayed) drawings. There is, after all, an air of implausibility about the Royal tiger. The landscape setting, which Delacroix has beautifully contrived so that the reposing animal’s sleek body is neatly echoed in the shapes of the distant mountain range, is altogether incongruous. The tiger’s real habitat is grassland and rainforest, where it can use its camouflage in the dense vegetation, not the bald, featureless terrain pictured here. Throughout his life Delacroix produced numerous drawings, watercolours and paintings of big cats, either reposing, at bay or in violent attack, and often incorporated them into his orientalist hunt scenes. 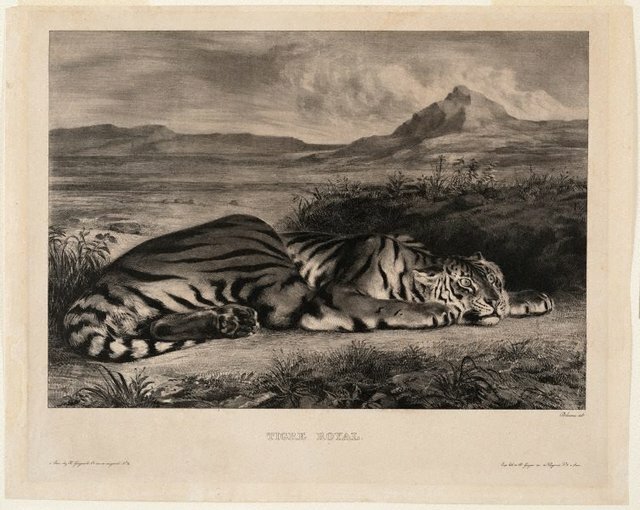 A comparable watercolour to the Royal tiger is in The Morgan Library & Museum, New York, although it was made after this famous lithograph.